As your baby grows into a toddler, it's time to trade bottles for cups. 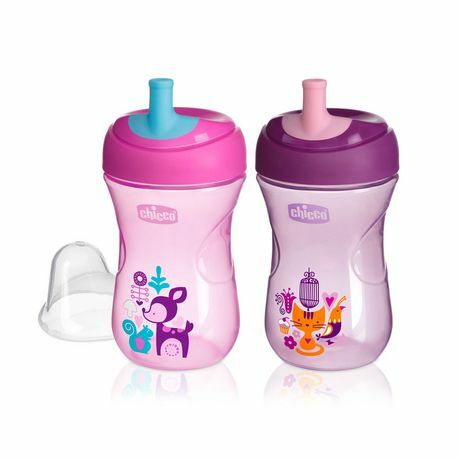 Chicco's full line of sippy cups makes the transition easier, training your little one to learn to drink without spills. The NaturalFit® First Straw Trainer has an easy-sip straw spout that's gentle on gums but bite-proof. The true straw shaped spout aids developing oral skills and is a great cup for active toddlers because it's spill-free. A one-piece valve only releases liquid when suction is applied to the spout. Plus, the valve can be removed for free-flow drinking practice. The contoured cup is specially designed for tiny hands to grab and hold. Ergonomic indents guide hand placement, teaching proper cup holding. A snap-on cap keeps the spout clean when not in use. Parents love the easy to clean, minimal parts. All parts are top rack dishwasher safe for convenience. • Bite-proof semi-firm straw spout. Made strong to stand up to those new pearly whites, but gentle enough for sensitive gums.